Launched in July of 2011, the riveting biotech thriller, WIRED, quickly became a runaway New York Times and USA Today bestseller. And in 2012, when Amazon published its list of the "100 Best-Selling Kindle Books of 2011," WIRED was #1 in two major categories: technothrillers and science fiction (19th overall). Now, to celebrate the April launch of the sequel, entitled AMPED, WIRED will be available at Amazon and Barnes & Noble for only $2.99. "Making the New York Times and USA today bestseller lists was incredible," says Douglas E. Richards, the book's author, "but the fact that WIRED was the bestselling Kindle book of the year for both science fiction and technothrillers is unprecedented, and a real thrill. Years ago, editors at several major publishing houses really liked WIRED, but weren't able to pigeonhole it. Was it a technothriller? Science Fiction? Because it didn't fit smoothly into a single category, they ultimately passed. So the fact that the book made it to the top of both of these categories is unbelievably gratifying to me." 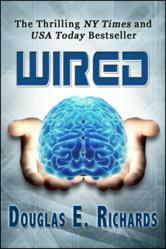 "WIRED is a keep-you-up-all-night thriller," says bestselling author Boyd Morrison. "It's packed with intense action, mind-blowing concepts, and breathtaking twists. I was blown away." WIRED's author, Douglas E. Richards, is a former genetic engineer and biotechnology executive who has written for National Geographic, the BBC, the Journal of Virology, and many others. In the book, Kira Miller is a brilliant but enigmatic genetic engineer who discovers how to temporarily achieve savant-like capabilities in all areas of thought and creativity. But she is also behind a bioterror plot that threatens millions. When ex-special forces operative David Desh is sent to capture her, he quickly learns that the bioterror plot is just the tip of the iceberg, and he is thrust into a byzantine maze of deception and intrigue. Soon, Desh becomes a key player in a deadly game he can't begin to understand. A game that is certain to have a dramatic impact on the future course of human history. . .
"Wired has a twisty plot, big ideas, and nonstop action and intrigue," says Ernest Lilley, founder of SFRevu and Senior Editor of TechRevu. "It'll have you guessing right up to the very end."